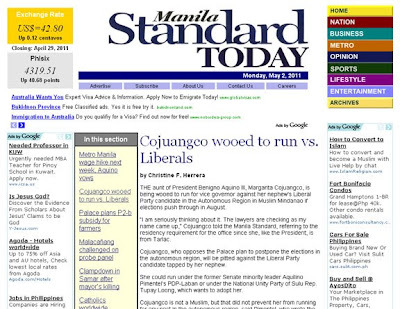 MANILA, Philippines - The aunt of President Benigno Aquino III, Margarita Cojuangco, is being wooed to run for vice governor against her nephew’s Liberal Party candidate in the Autonomous Region in Muslim Mindanao if elections push through in August. “I am seriously thinking about it. 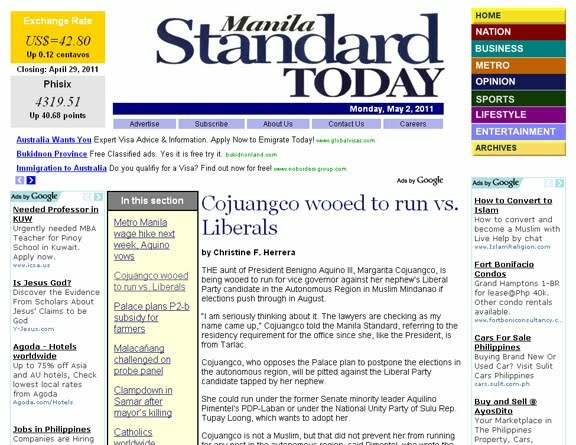 The lawyers are checking as my name came up,” Cojuangco told the Manila Standard, referring to the residency requirement for the office since she, like the President, is from Tarlac. Cojuangco, who opposes the Palace plan to postpone the elections in the autonomous region, will be pitted against the Liberal Party candidate tapped by her nephew. She could run under the former Senate minority leader Aquilino Pimentel’s PDP-Laban or under the National Unity Party of Sulu Rep. Tupay Loong, which wants to adopt her. Cojuangco is not a Muslim, but that did not prevent her from running for any post in the autonomous region, said Pimentel, who wrote the ARMM Organic Act. Loong said Cojuangco had established residence in Maguindanao and had had fully furnished homes in Zamboanga and Tawi-Tawi since 1988. Cojuangco, a former Tarlac governor, said she had opted to establish residence in most provinces in Mindanao because she and her husband, former Tarlac Rep. Jose Cojuangco, had been involved in several projects there since 1988, or two years after the President’s mother, the late President Corazon Aquino, came to power. Mindanao had become a second home for the couple, Cojuangco said. Cojuangco was adopted as a daughter of the Lanao Sur Sultanate of Baloi in 1990. “Cojuangco became well-known and well-loved in the Muslim communities because she and her husband were instrumental in the peace process in the region, and for providing residents with livelihood projects for more than two decades now,” Loong said. Loong, who voted against the postponement of the ARMM elections, said Muslim leaders were already preparing the line-up for the August elections in case the Senate rejected the bill to postpone the polls to 2013. The President has certified as urgent the bill that allows him to appoint interim local officials in the region until the 2013 elections.